We are here to give superlative service for you and your pets care and comfort. We are the full service pet resort, spa and salon, with a complete line of basic pet supplies. Specializing in the care and comfort of your pet is our focus. 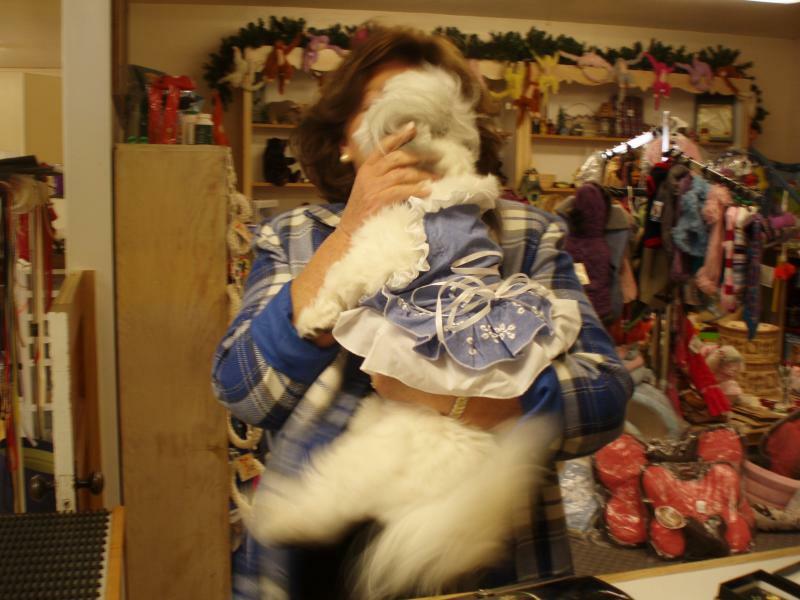 Our experienced and caring staff has 30 plus years grooming and caring for all breeds. We are currently located at 310 South Main Street in Yerington, Nevada. (775) 463-5141. We are delighted to announce our recent move to the new building complex. We have expanded our accomodations to serve the needs of you and your pet. We love to pamper our clients in a first class style. Our indoor facility features climate and sound control for a warm and peaceful environment. The cheery country setting leads to friendly social interaction. The resort is so much fun. We invite you back again and again. Come stay with us and paws for a spa! BARK is Yerington's local non-profit (501-c-3) Canine Rescue Group. Happy Tales Camp Safe Haven is the home of B.A.R.K. and the rescue dogs. Their goal is to rescue, rehabilitate and rehome these dogs. They also have a vet fund for emergency care of the Yerington Animal Shelter dogs. BARK is looking to expand it's membership and volunteer numbers. They need office personel, dog walkers, help showing the available dogs at events and fundraiser activities. There is nothing more rewarding that being a "pet angel". Please contact Pres. Theresa at 775 463-3404 for more info. Watch our site for upcoming event posts. P.E.T. is not just for our pets! Positive Energy Touch and all it's healing properties has come to Yerington by way of Happy Tales. We help people feel happy, look good and live well with our new full service health and wellness center. This is an upscale, tranquil addition to Happy Tales Resort. From the water features to the wall murals, you must see it to fully experience it. The idea stemmed from extending our pampering services to include the "Moms & Dads" of our furry friends. Some of the delights at the people's spa are; Massage, European Facial, Hand & Foot Treatments, Body Waxing, Scrubs & Wraps, Sauna, Shower & Spray Tan Booth. Watch for our living ionized water on tap, just for you. This is life giving alkaline water that you can drink at the wellness center or take home with you. Our girl Ellie, aka Noel; (one of 145 dogs from Gabbs, NV) lived in the Tippets home for seven months. She had a new pack consisting of two Schnauzers, an English Setter with a new litter of puppies (one of the puppies was also a rescue- see "another amazing story"), three cats, two goats and a horse. Everything in the world was full of color and activity, far outside of Ellie's comfort. She had to adjust to being inside, to human voice and touch. She learned how to walk on a leash, ride in a car, socialize with the family, play and run, ask to go outside and to come when I whistled. She even decided that she could do herding work with the goats! I took Ellie everywhere with me. She dragged a long leash around for months and at times I literally had her tied to my waist. I came to love Ellie and had tears of joy and pride as I watched her personality blossom as her confidence grew. She graduated from ferral to friend. When she started coming up and nudging me for attention, I knew it was time for her to have her special forever home. Ellie has gone on to live at Cirrus Ranch. Owner and trainer, Robin Wenham works full time in canine rescue and rehabilitation. Ellie has joined his pack to help rehab and train other dogs. And she gets to run on the beach...what a special girl!